#ThirstyThursday: Does Luxury Cognac Go Well With Hawker Fare? A dimly-lit KTV lounge filled with very wealthy businessmen, red-faced and badly singing oldies, comes to mind when the mention of the cognac spirit. In other settings, the brandy is an indicator of power and affluence, where the prestigious either have the tipple on monumental occasions or with polished pairings such as dark chocolates pieces and cheese on crackers. 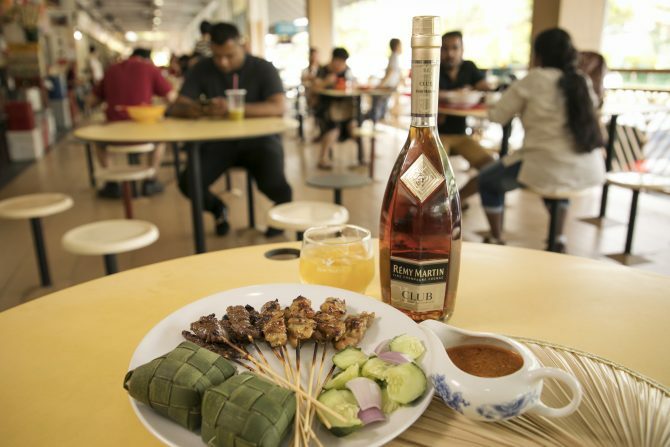 Ironically, we found ourselves huddled up at Old Changi Aiport Hawker Centre to savour the liquid gold of Rémy Martin cognacs with some Singapore hawker favourites. The goal in mind? To shine the light on the misunderstood spirit, showcasing its versatility that we all can enjoy in venues we love. Pardon our rather unrefined tastebuds, but we’re without the capabilities of savouring the potent cognac in its purest form. And especially when it comes to a rock glass of Rémy Martin CLUB consisting champagne eaux-de-vie aged up to 20 years old, we need splashes of ginger ale to tide you through. Gratifyingly, the cognac, coupled with ice cubes, elevates to a refreshing highball, like a boozy iced tea, while still retaining the intense depths of dry fruits intertwine with oaky notes. A fitting accomplice is the equally flavourful chicken satay ($0.60 per stick), slightly charred and glistening in oil. But with or without peanut sauce? We thoroughly enjoyed both variations and couldn’t decide on a favourite. Boasting grilled almonds on the nose, the club cognac undoubtedly amplified the nuttiness and smokiness of the grilled skewers, making for a match made in heaven.